It was a lovely lazy Saturday. The rain started around 9am and continued off and on through out the day. I bet the wild flowers are going to bloom like crazy now. I've seen a few flowers here and there but nothing like it should be. Of course, I took a nap because that is what I do on Saturdays if I can get away with it. I also did laundry, cooked food for the week, removed a dozen items out of my closet for the thrift store, and watched too much TV. The one thing that I didn't do was my taxes. Well, Sunday is still open for that. The puddles in my yard reminded me where the gravel should go. 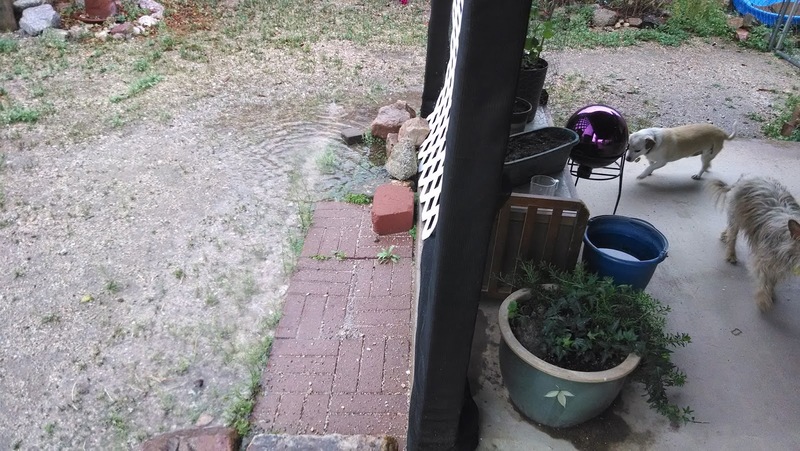 Water drips off the patio cover and the yard is not sloped correctly so it just floods and then slowly soaks in. It would be nice to have gutters and a container for rainwater collection. That's on my wishlist. The wind picked up after the rain and bent my snow peas. Too bad, they were doing so well. Last year the puppies ate my snow peas. This year they wind did them in. So sad. The wind also tried to blow over my tomato shade cover. I had to prop it up with another pole. I think the tomatoes are ok though. My quail cage stand worked well. They are protected from the wind on that side of the house. At least my stand didn't fall down or rip apart. I listed my 3 noisy quail on craig's list and I am supposed to meet someone to buy them tomorrow. I hope that works out because I am tired of listening to them. I am keeping my 3 quiet quail. 3 people asked about buying my quail. Perhaps there is a market for quail in Tucson. I'm not ready to start hatching more quail or anything. This is all still an experiment. See my little dog? He loves quail, as in, would love to eat quail. He hasn't had a chance yet. 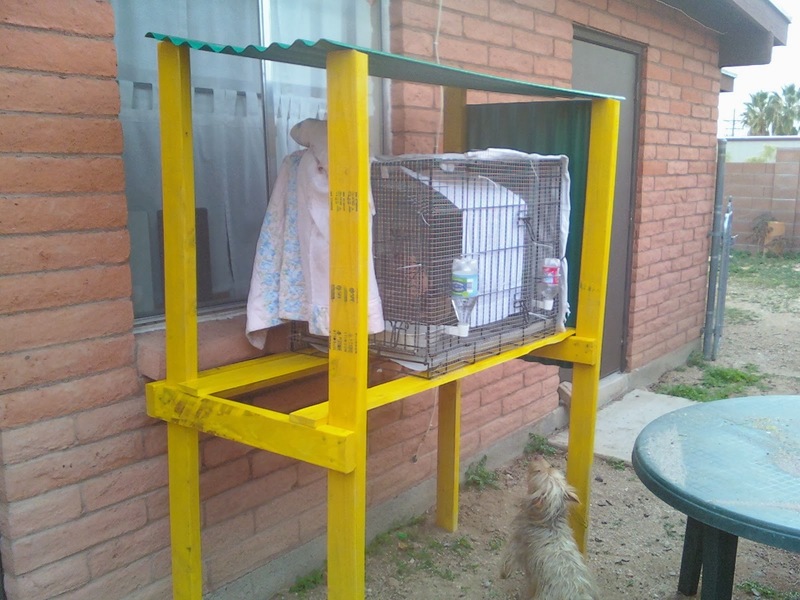 I hope your setup doesn't end up being for the birds hahaha. Glad to read you get a Saturday nap. Once you retire, you will be alb eto nap every day just like I have been doing. It's my favorite part of the day, moreso now that I don't sleep as well as I used to. Lizzie, eventually, I want 2 story quail but this will do for now. Dave, I think naps when I want naps are my main semi-retirement motivation. I love being able to nap when I want to and to stay up working on a project all night when I want to. It will be nice to do it again soon.